The 710 is one of the most important freeways in Southern California. It’s also shorter than originally planned: For nearly 50 years, legal and environmental challenges have stalled the freeway in Alhambra, 4.5 miles short of its intended destination, Pasadena. Over the decades, discussions about extending the freeway have cast its future as a local issue. But the 710 causes traffic, produces pollution, and affects commerce across Los Angeles and even beyond. How broad are these impacts, and what role might the stalled extension play in them? What would the five options now being debated for dealing with the Alhambra-to-Pasadena gap–implementing new surface traffic technology and strategies, new rapid bus transit, light rail transit, a freeway tunnel, or building nothing at all–mean for our region? The $780 million set aside for the project in Measure R would go a long way towards transit, but most of the alternatives being considered, especially a highway tunnel, would require major additional funding. With Caltrans so heavily involved, and with the clout of port traffic, it’s hard to imagine the advocates of expanding the “concrete commons” won’t win out. Though maybe continued strong community opposition and a winning Braess’s paradox argument could be successful in finally killing the project. On a related note, the release of draft environmental documents for the project has been pushed back to February 2015. 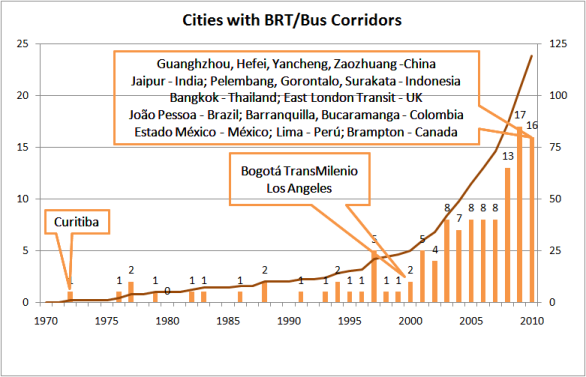 Bogotá’s bus rapid transit system has been touted as an example worldwide. Heavily promoted by the city’s former mayor, Enrique Peñalosa, it has been used as a model for systems I have explored in Guatemala City, Panama City, Dar es Salaam, Cape Town, and Johannesburg, among other places. And along with the rhetoric about BRT being a tool for building public space in cities comes an array of Colombian consulting firms and private bus operating companies. It was a fascinating experience for me finally to be at the source of the BRT craze last January, especially after my year studying BRT around the world. These buses are super well-maintained – polished every three months! In January, I spent 24 hours in Medellín, Colombia, before an urban design workshop being held in Bogotá. While it wasn’t nearly enough time in the city, I was excited to explore some of the internationally-renowned public spaces and the new bus and metrocable transit lines. Jaime Lerner discusses Curitiba-style "Urban Acupuncture"
Former Mayor of Curitiba and Governor of Paraná Jaime Lerner gave the keynote address at Transforming Transportation 2012. He highlighted the use of “urban acupuncture” and “focal interventions,” used in conjunction with the planning process, to catalyze urban improvements. He also cautioned against unsuccessful and disorganized implementations of bus rapid transit, especially those that do not integrate well with the “concept of a city.” Highlights of his dynamic and comedic speech, and the complete set of slides he used, are both embedded below. Last week, transit leaders from around the world converged on Washington, D.C. for Transforming Transportation 2012. The two-day event, hosted by EMBARQ, The World Bank, Inter-American Development Bank, Asian Development Bank, Institute for Transportation Development and Policy, Clean Air Initiative for Asian Cities, and the Partnership for Sustainable Low Carbon Transport, included a number of speakers suggesting ways to scale-up sustainable transportation systems. Jaime Lerner describes his “urban acupuncture” approach. A video with highlights from his keynote address is available here. Federico von Buchwald, President of the Metrovía Foundation and Vice-President of SIBRT, presents on Guayaquil’s BRT system (available below in the full post). At the end of May, the Mayor of Buenos Aires inaugurated Argentina’s first BRT line (English summary here). Metrobus incorporates lines 34 and 166 (operated by the private companies Juan B. Justo S.A.T.C.I. and Empresa Linea 216, S.A.T., respectively), which run along Juan B. Justo Avenue between Palermo and Liniers. The new corridor consists of dedicated center lanes and raised stops. During construction, neighbors complained about traffic disruptions and the slow pace of work. The city openly stated that taking away general use lanes along the avenue would add to travel time for private automobiles; transit priority is an important part of the municipal government’s Sustainable Mobility Plan. “We were expecting ridership growth of 20% in the medium term, but in the first weeks we halve already come to record more than 15%,” staff of the Secretary of Transportation said. According to their explanation, this is due mostly to people realizing that they can travel more quickly and safely with the dedicated lanes, because the drivers can no longer pass each other nor do they need to brake abruptly in stops or corners. “And, incidentally, this also benefits auto drivers, who now drive more relaxed separated from buses,” they added. According to their statistics, the growth of passengers has been recorded, above all, in Line 34, where 18% more users are now noted. Despite the protracted construction process (pictures below), the system seems to be gaining ground as an important tool for sustainable mobility in Buenos Aires.